Two people on opposite sides of a civil war. Frances Dreda is an officer in the Taylian State Security Bureau who enforces obedience to the law by the deterrent of prison and the noose. He investigates the activities of the outspoken and intellectual Lady Felea Whelani who he suspects aids the rebels by codebreaking and feeding and educating their children. They should be mortal enemies but are intrigued by each other but he mistrusts women and Felea is repulsed by his detachment and his severity. Can love overcome cultural differences and prejudice? Can Felea humanise this officer? 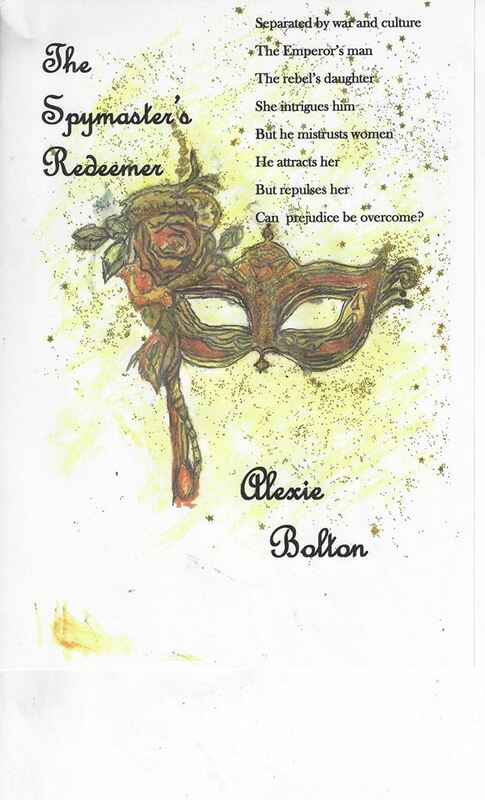 Alexie Bolton’s The Spymaster’s Redeemer, the author’s first novel, kept me entertained from beginning to end. It is a sweeping historical romance with complex characters and a well developed plot. The central story is that of the relationship between the two protagonists – the ‘Spymaster’ of the title Frances Dreda, and Lady Felea, the daughter of an academic suspected of supporting enemies of the Emperor of Taylia, a fictional country near the Austria- Hungary border. There is also much emphasis on the politics and power play between different individuals and factions. The push and pull between the couple also highlight the differing expectations put on men and women. I found the result to be a thoroughly compulsive read as the author skilfully weaves these different threads together. I enjoyed both the sexual tension and the heated exchanges between Dreda and Felea which begin as soon as their paths cross. Dreda is investigating her father’s potential guilt, a crime punishable by death and as his daughter Felea herself is under suspicion. Dreda takes an uncharacteristic personal interest in the case as something about the young woman intrigues him, taking it on himself to establish the extent of her guilt or innocence. As for Felea, she fears for her own fate and that of her father and wants rid of this odious man who is an unwelcome threat to her sanity and wellbeing! I will not divulge how the plot develops, suffice to say that the story is a complex one and is full of unexpected twists with plenty of action, suspense and romance. Of particular merit is the good job the author does in developing both Dreda’s and Felea’s characters. I found Dreda to be a fascinating individual who attracts and repels at the same time. As the Emperor’s right hand man, he is cold and calculating, a misogynist who uses women for his own ends and a master manipulator. Felea blindsides him not only with her exuberance and apparent innocence but also with her intelligence. I enjoyed how she gets under his skin and challenges his preconceptions. For her part she is an accomplished individual due to the freedoms given to her by her academic father and loathes the thought of being controlled by a man. Although they are opposites in many respects, they are well matched and I enjoyed how their relationship develops given the obstacles in their way, not least their own pride and preconceptions. It is an impressive first novel by the author and I am looking forward to reading more of her work.